You are here: Home / Business Architecture / How well do you know your business processes? Organisations, commercial and non commercial, serve groups of people who can be regarded as clients or customers. It is essential that every organisation understands what these customers value. 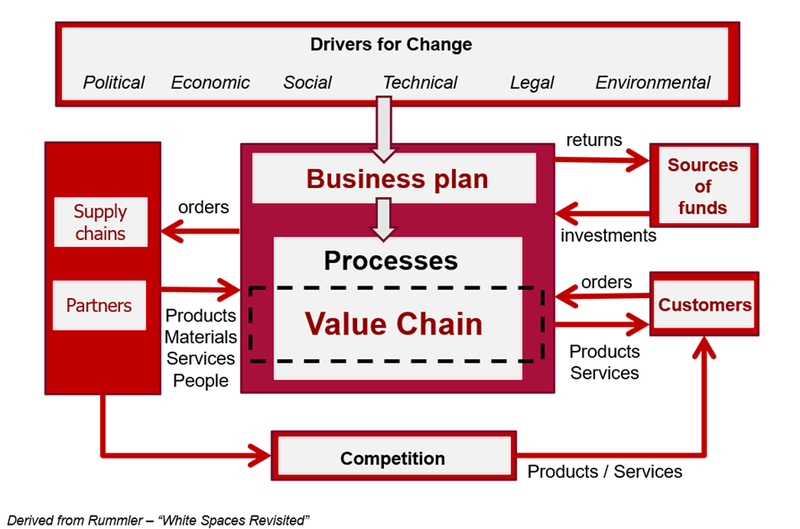 The organisation must create that value and create a strategy to deliver it. Appreciation of the strategy to deliver that value. This is the basis for boosting business agility. 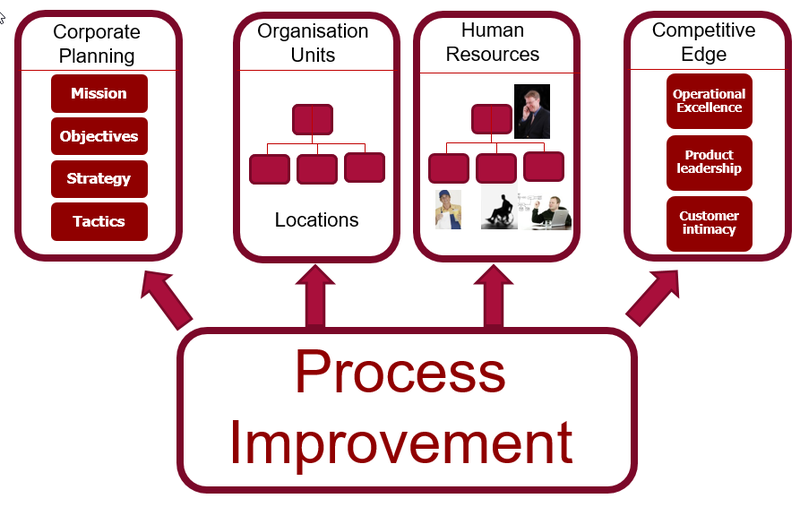 The top three rows of the ‘How’ column are concerned with defining and modelling the business processes. The language of these rows is the language of the business stakeholders. Row 1: Contextual. Try to list all of your organisation’s core and support business processes. Row 2: Conceptual. Try to identify the areas of activity that your organisation is concerned with. Highlight the dependencies between these areas. Peter Checkland pioneered the development of such models, in what he termed, ‘Soft Systems Methodology’. For more on this topic, see, ‘Soft Systems Thinking, Methodology and the Management of Change’ by Happeren and Wilson. Row 3: Logical. Logical process models are popularly shown in the form of swim lane diagrams, a technique pioneered by Rummler. Popular notations for such models include Business Process Modelling Notation (BPMN) and UML Activity Diagrams. The lower three rows of the Zachman framework are concerned with increasingly technical views of how the business processes are supported by IT. These rows are of interest primarily to technical strategists and architects and to those roles that are responsible for making purchasing decisions on systems software and hardware. The business analyst should be able to contribute to discussions on IT strategy for technical support of business processes. The business analyst should therefore have, at least, an appreciation of the technology. They need to be aware of what technologies are available, e.g. for automating workflows. 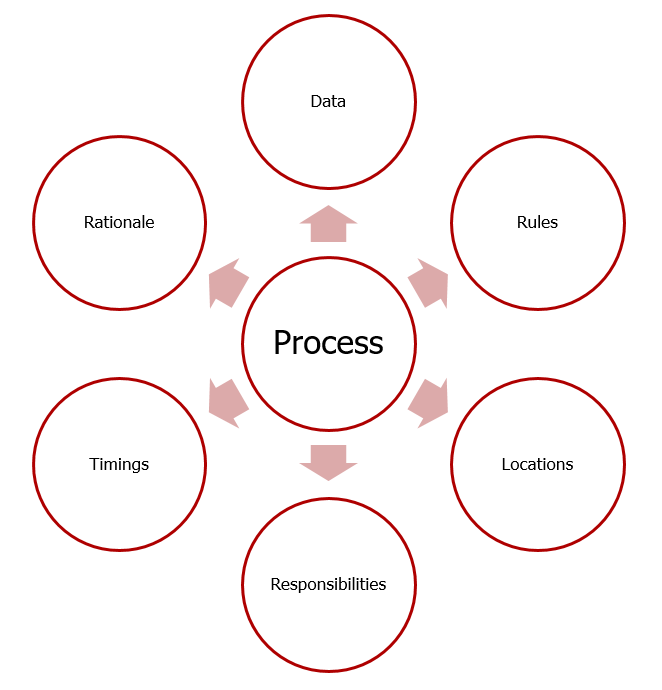 Many of an organisation’s business processes provide routine support. A critical subset are strategically important and deliver value created by a business. These are the core processes. The goals of these processes are crucially linked to the strategic objectives of the organisation. 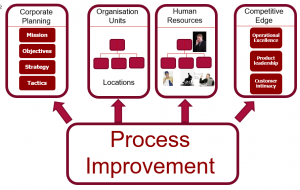 All organisations must continually find ways to incrementally improve business process performance. Many such approaches to improvement are inspired by ideas from Japanese manufacturing sectors. See, for example, the publication, ‘This is Lean’, by Modig. If any core business process is not effectively supporting the business strategy and goals we may need to take a more radical approach to improvement. Radical improvement was the subject of Hammer and Champy’s ‘Re-engineering the Corporation‘ some years back. That approach spawned a number of later ideas and approaches. If there is a change to the environment in which the organisation operates, prompting a need to change strategic goals and approach, then one or more core processes will probably need to be changed.